Young Mary Smith has moved to live at the country home of her Great-Aunt Charlotte in the town of Redmanor. She meets Peter, a local boy who makes deliveries on his bicycle. Later she follows Peter’s two cats into the woods and picks a strange blue flower she finds growing there. The gardener Zebedee tells her that it is a very rare Fly-By-Night flower that only blooms once every few years. The next day she wanders back into the mist in the woods against Peter’s warnings and finds a broomstick. Juice from the flower spills on her hands and the broom and she abruptly finds that it is able to fly aboard the broomstick. With her and the cat Tib aboard, the broomstick takes off into the clouds and lands on an island floating there. She learns that this is Endor College, a school for magic. The headmistress Madame Mumblechook and her chief scientist Doctor Dee think that Mary is a great witch because she has red hair. When Mary accidentally mentions that she has the flower, they eagerly want to obtain it, believing it holds the possibilities to allow great magic. Mary returns home but she has left behind a note with Peter’s address and Madame Mumblechook comes down and snatches him in order to make Mary give up the flower. Mary and the Witch’s Flower was the third film from director Hiromasa Yonebayashi. Yonebayashi started out as a general animator working for Hayao Miyazaki on Princess Mononoke (1997) and has performed duties on a number of other Studio Ghibli works. He was granted the director’s seat by Ghibli with Arrietty/The Secret World of Arrietty (2010) and went on to also make When Marnie Was There (2014) for them. Mary and the Witch’s Flower was the first production from Studio Ponoc, an animation house set up by several former Ghibli employees. All of Hiromasa Yonebayashi’s films so far are works based on books by British children’s authors. 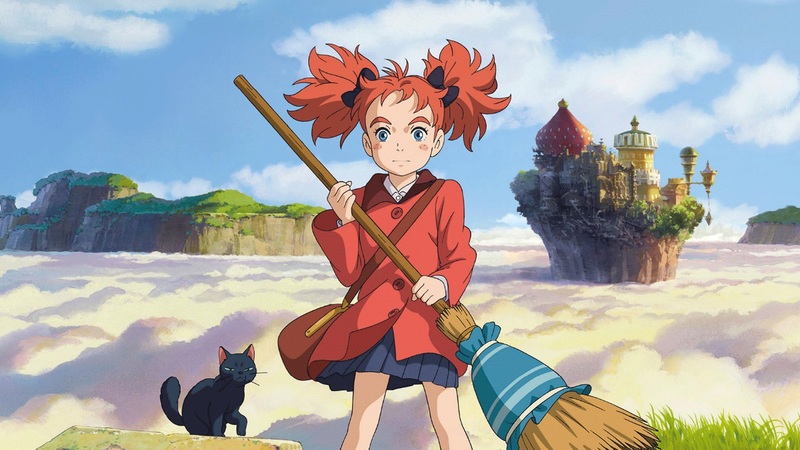 In this case, Mary and the Witch’s Flower is adapted from The Little Broomstick (1971), a children’s book by Mary Stewart (1916-2014), who was known for a series of historical romance novels and in particular a trilogy of books that retells the Arthurian legends from the viewpoint of Merlin. Hiromasa Yonebayashi is seen as the carrier of the mantle of Hayao Miyazaki in that his films most often approximate Miyazaki’s works and visual style. If one did not know otherwise you could easily see any of Yonebayashi’s films as unknown Miyazaki works, so much do they come with the same artistic style, visual palette, themes and characters. Mary and the Witch’s Flower touches base with many motifs that run throughout Miyazaki. It is hard not to see Mary and the cat flying on her broom as a sister to Kiki in Kiki’s Delivery Service (1989). The city on the island of land in the clouds echoes Laputa: Castle in the Sky (1986). The girl discovering a secret magical world while staying with her relatives in the placid countryside echoes My Neighbor Totoro (1988). Mary and the Witch’s Flower is an amiable film. It is sweet and likeable. It has the typical Miyazaki heroine of indeterminately pre- or post-adolescent age who takes on the whole world armed with little more than her pure-hearted determination. The plot is okay, although the emotional highs and lows are never quite the ones that a Miyazaki film finds, which makes Mary and the Witch’s Flower a slighter work by comparison. The witch’s school is one that Yonebayashi and co have determined to create with colour and energy and not make the film just another Harry Potter knockoff – even a peculiar mix of magic and technology, including a weird scientist who scuttles about in a crab-like waldo suit accompanied by an army of robots.